Who doesn’t love chocolate and caramel? If someone like that exists, I don’t know him or her. I, for one, live for chocolate and caramel – it’s such a rare treat that I savor every last bite when I allow myself to have it. Today was that day. Today’s story: a craving for sweets meets boredom meets no real food in the house. This sounded to me like an opportunity for creativity. I’ve been stuck in the house for two days with a sick kid, so grocery shopping has not gotten done and we are both at our wits end with boredom. I realized earlier that I hadn’t posted in a while, and I didn’t want a lack of groceries to stop me. 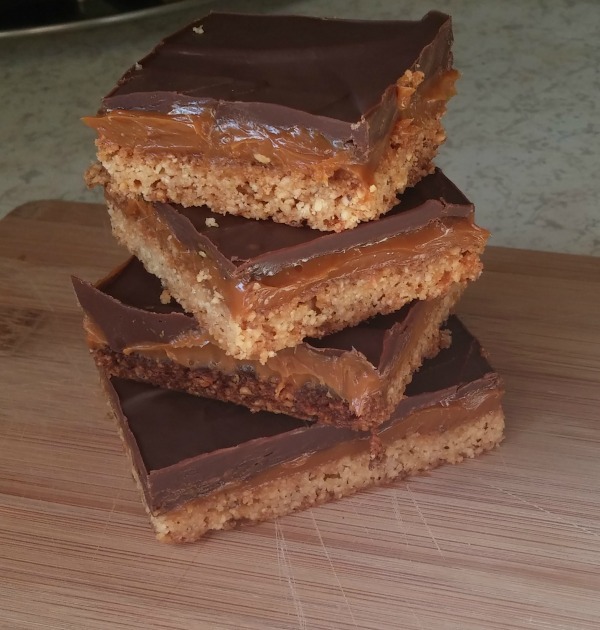 I decided to make a simple cookie-like crust with the almond flour and go from there and what I ended up with loosely resembles Twix candy bars – and it’s just as yummy. 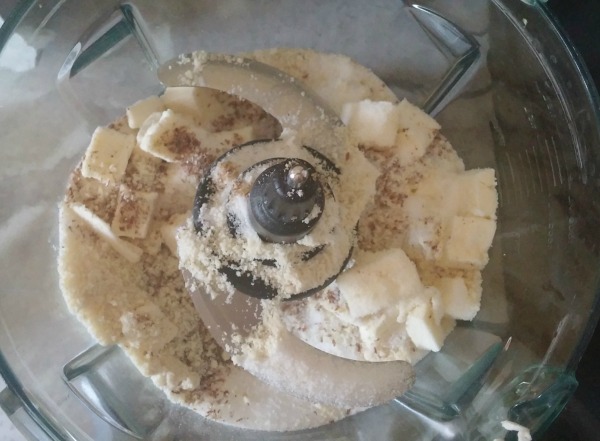 Cut the butter into small pieces and put everything into the food processor, then pulse it until it is crumbly. 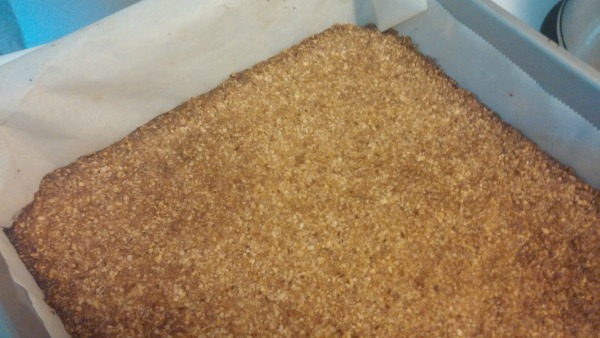 Press it into the bottom of a 9 x 9 brownie pan that you’ve lined with parchment paper. 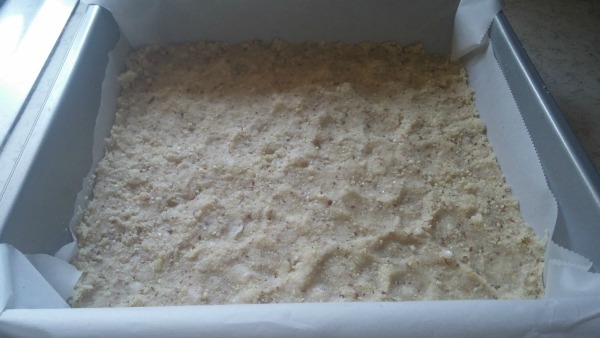 Pop it into the oven at 325ᴼ for about 12-15 minutes. 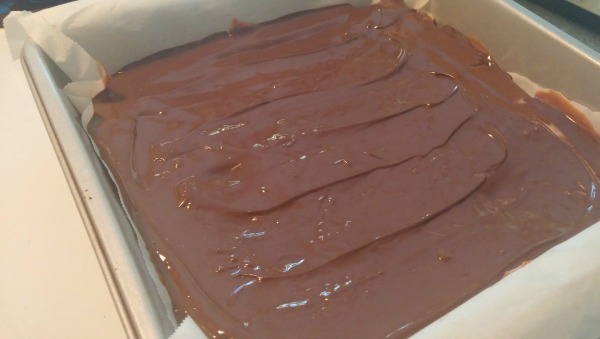 Pull it out and let it cool while you’re preparing the caramel. 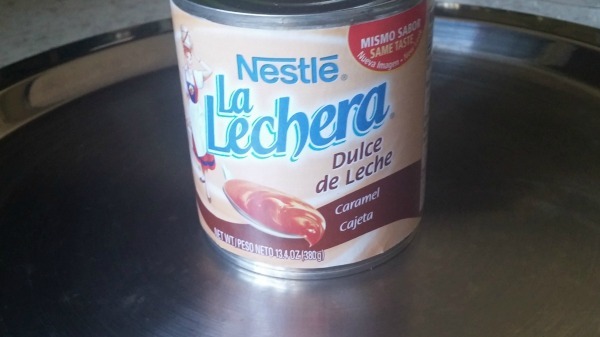 To prepare the caramel, I just popped open the can of dulce de leche and put it into a small metal bowl, and then created sort of a double-boiler situation by placing the metal bowl inside of a saucepan that had a couple of inches of almost-boiling water in it. You could always just put it into a microwave-safe bowl and nuke it, but just keep a careful eye on it – you don’t want to burn it. When the caramel is nice and hot and creamy, pour it over the crust and spread it out all the way to the edges. 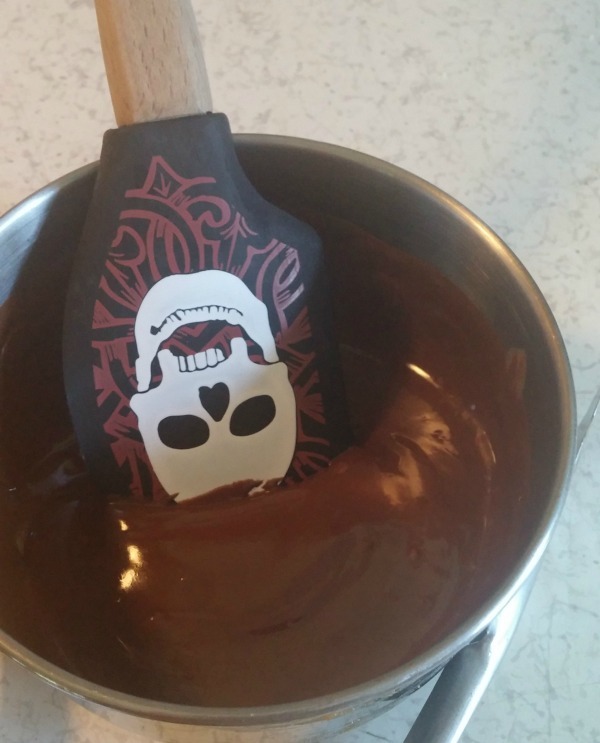 Put it in the fridge while you prepare the chocolate. 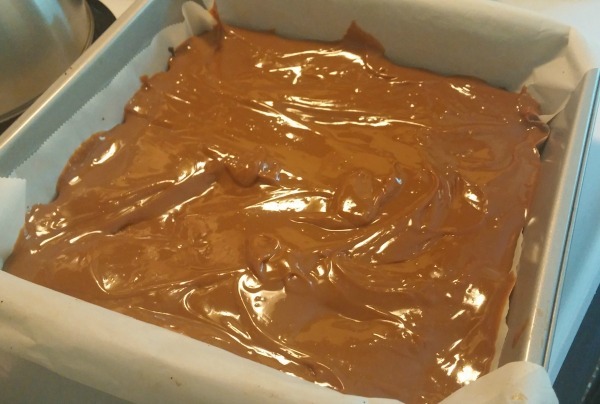 The chocolate is just as easy to prepare as the caramel; in fact, it’s the same process. 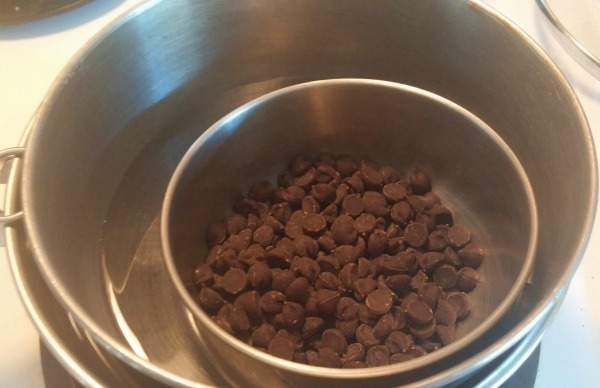 I used the same pan of water to melt about 1/2 a cup of chocolate, stirring frequently. 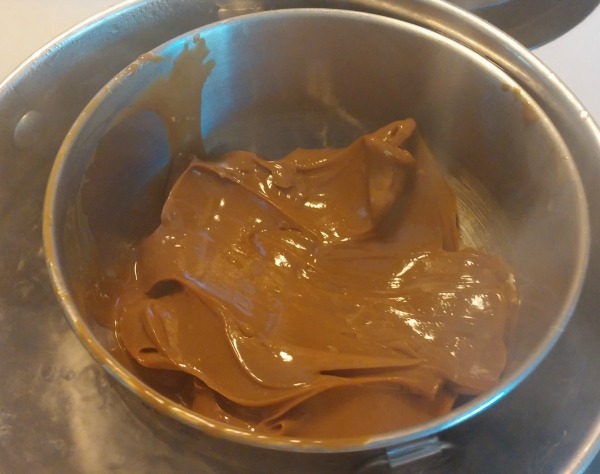 When the chocolate is all melted, go ahead and pour it over the caramel and spread it out. Put the whole thing into the fridge for a couple of hours until it’s all set – the chocolate will harden and you’ll know it’s ready. 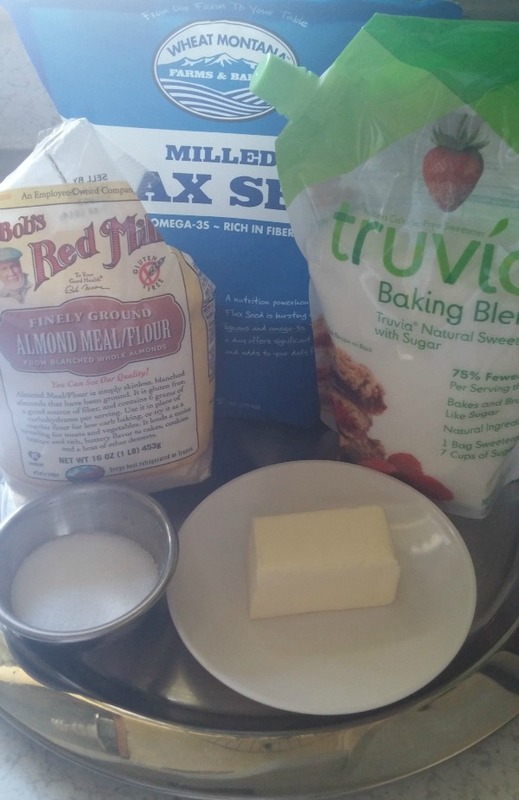 Slice into squares and serve. Store leftovers in the refrigerator.